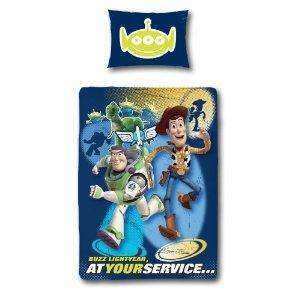 Hardwearing and colourful Toy Story 3 panel printed single duvet and pillowcase. It is machine washable at 40° and can be tumble dried.The original gang are back along with a raft of new toys. As Andy prepares to go to college, Buzz, Woody and the rest of his toys are troubled about their uncertain future. The toys find themselves in a room full of unnamed tots who can’t wait to get their hands on the “new” toys. It’s pandemonium as they try to stay together and ensure no toy gets left behind.